Rudolph III (called "the Idle" (French: Rodolphe le Fainéant, German: Rudolf der Faule) or "the Pious" (le Pieux); c. 970 – 6 September 1032) was King of Burgundy from 993 until his death. He was the last ruler of an independent Kingdom of Arles, also called the Second Kingdom of Burgundy, and the last male member of the Burgundian group of the Elder House of Welf. Rudolph was the son and heir of King Conrad I of Burgundy (925–993). His mother Matilda (943–980), a member of the Frankish Carolingian dynasty, was the daughter of King Louis IV of France. Rudolph himself had three sisters: Gerberga, who married Duke Herman II of Swabia about 988, Bertha, married to Count Odo I of Blois and secondly to King Robert II of France in 996, and Gisela, who married the Ottonian duke Henry II of Bavaria and became the mother of Emperor Henry II. Rudolph succeeded to the Burgundian throne upon his father's death on 19 October 993 and was crowned king in Lausanne. His reign was marked with turbulence when he made attempts to confiscate several Burgundian estates. Unable to placate the increasingly powerful nobility, he also had to deal with encroachments of power on the part of Count Otto-William of Burgundy. Like his father, Rudolph approached to the German Ottonian dynasty to stabilise his rule. His aunt Adelaide of Italy, widow of Emperor Otto I, and her grandson Otto III actively intervened in Burgundian affairs to secure his accession to power. In turn, Rudolph in 1006 ceded the city of Basel to his nephew Henry II, elected King of the Romans as head of the Kingdom of Germany in 1002. 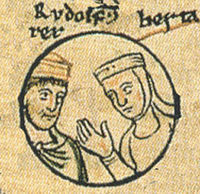 Rudolph's first marriage with one Agiltrud (died 1011) remained childless. On 28 June 1011, he married Ermengarde of Burgundy, a relative of Count Humbert I of Savoy and widow of Count Rotbold II of Provence. Rudolph vested her with the County of Vienne and Sermorens and further large estates up to Lake Geneva. However, no children were born from his second marriage too. When in 1016 King Rudolph entered into another conflict with Count Otto-William over the investiture of the Archbishop of Besançon, he and Emperor Henry II met in Straßburg where Henry succeeded in negotiating Rudolph to name him as his successor. Henry marched against Otto-William and the Burgundian nobles quickly submitted. Henry's right of succession was confirmed at a 1018 diet in Mainz, however, upon his death in 1024, the question appeared again unsettled. Henry's Salian successor, King Conrad II occupied Basel and also began to negotiate with Rudolph to become his heir. Rudolph was present at Conrad's imperial coronation at Easter 1027 and in August an inheritance contract was concluded. This agreement was contested by Rudolph's nobles, Count Odo II of Blois and Count Reginald I of Burgundy. Rudolph died in 1032, at the age of 61, with no surviving issue. He was buried in Lausanne Cathedral. Conrad II then claimed the Burgundian Kingdom of Arles and incorporated it in the Holy Roman Empire. As the last member of the Burgundian Welfs, Rudolph was considered a weak ruler by his contemporaries. The chronicler Wipo of Burgundy called him effete; according to Hermann of Reichenau, his rule was marked by idleness and chaos. Thietmar of Merseburg named the Burgundian counts the actual rulers, while Rudolph only held the royal title. At least from 1018, Rudolph actually ruled as a mock king in the shadow of his designated successor, who also interfered in domestic conflicts. Emperor Conrad II likewise had to defend his right of succession against the embittered resistance of the Burgundian nobility. In 1038 he had his son Henry III elevated to a King of Burgundy at Solothurn, enforcing the homage by the nobles. ^ a b c Previte-Orton 1912, p. 13-14. ^ Previte-Orton 1912, p. 16. ^ a b Previte-Orton 1912, p. 27-28. Previte-Orton, C.W. (1912). The Early History of the House of Savoy. Cambridge University Press.